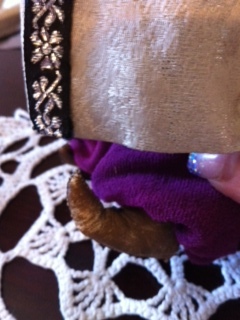 WE PURCHASED A BOX OF DOLLS AT AN ANTIQUE AUCTION....THIS DOLL WAS IN THE BOX...I CAN'T SEEM TO FIND ANYTHING ON HIM. HE HAS LEATHER GENIE SHOES AND HIS FACE IS VERY FADED AND FEELS LIKE VERY SOFT LEATHER. HE HAS A PIECE OF WOOD? IN HIS MOUTH LOOKS LIKE SOMETHING WAS BROKEN OFF A SMOKE????? IF ANYONE KNOW WHAT HE COULD BE PLEASE HELP!!!! I WOULD APPRECIATE IT. THANKS A BUNCH!!! 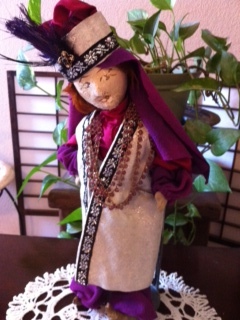 I have a doll made like this from the twenties. Clothing is similar, and mine is from Iran. Check Pam and Polly Judd's Asian and African Dolls.